Hi I need some help how to setup a JCA connector in Wildfly 10. My problem is that I can't figure out how to inject the resource into my Stateless Session EJB. I tried also to setup a resource ref via the ejb-jar..xml file. But this all did not work. P.S: You can use mappedName attribute too, but that's not a portable attribute, across application servers, whereas lookup attribute is. In WildFly though both lookup attribute and mappedName play the same role. This tutorial don't need a rar.xml file and it seems to work. So I try now to implement it in this way. But JCA is really hard stuff because it's so little documented. Can you change that to use-java-context=true and try out the @Resource annotation that I suggested previously? If that doesn't work too, can you paste the entire exception stacktrace? I am now in phase where I am deeply frustrated. I put the jca file (With my classes) directly into the EAR/lib directory, so my application is aware of the class files. All this is a poke in the fog. Because I can't seem to check the status of the module. What I ask myself is: should not be the jca module deployed in wildfly like a Database module in the path /t/wildfly/modules/ with a modul.xml ? Hi jaikiran, yes I tried also the option use-java-context="true"
it seems that a ra.xml file is not necessary. Is it sufficient to drop the rar file into the /standalone/deployments/ folder or to deploy it via the web-console? Or should I follow another approach to deploy a rar? Would It not do more sense to install a "module" in the wildfly/module path (like I can do with eclipse-link , or a Database Module ) ? But this does not work. The classes, which are part of my rar module are not visible to my application. But this s not work. Because of the member variable 'HelloWorldConnectionFactory' which is part of my rar the bean is not available. And as far as I understand mus construct a kind of dependency form my war module to the rar module? Some comments from my side: we are using a 3rd party resource adapter Maven Repository: net.java.xadisk » xadisk » 1.2.2 and also one build by our own. A ra.xml file is not needed. Unfortunately I could not build your rar file. The last version of your jboss-deployment-structure looks quite good. Just remove the resources section. It is not necessary. 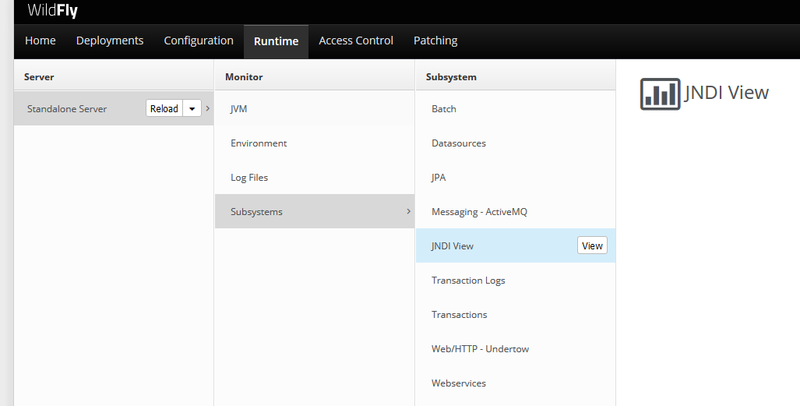 JBoss / Wildfly WebConsole offers a JNDI-View to lookup the JNDI name of your module. At least your sources contain a ironjacamar.xml file where you define a different jndi name. Try without this file first. And for the client app: don't use the ejb-jar.xml. Ok I will pick it up again and try it again. The hint with the jndi-viewer is very valuable. I didn't know there was this feature. No I will first fix my public imixs-archive-hadoop-jca module so you can build it. The build process is now working correctly. I finally succeeded to test the JCA Adapter successful with this simple WebServlet! So I now know, that the rar module is ok. This is a surprising exception, can anybody give me a hint what this could mean? But I think I am approaching now the crux of my problem.. This tutoral shows how to implement a JCA Adapter without the need for an ra.xml file and no additional configuration in the standalone.xml. The adapter is deployed with the help of the 'ironjacamar' wich is part of Wildfly. This is a generic example of how a JCA connector could work with transaction support. Also this example needs no ra.xml file. To deploy the adapter the standalone.xml file must provide a corresponding configuration section. A JCA Adapter can be deployed as any other artifact. But the .jar File must be renamed into '.rar'! This file extension indicates the module as an JCA adapter! Otherwise the adapter will not work. The client code (e.g a Web module or a Ear Bundle) must not include the JCA Adapter code! For Maven projects this means that the dependecy of the corresponding maven artifacts have to be marked with scope 'provided'. This is important to avoid class loading conflicts. 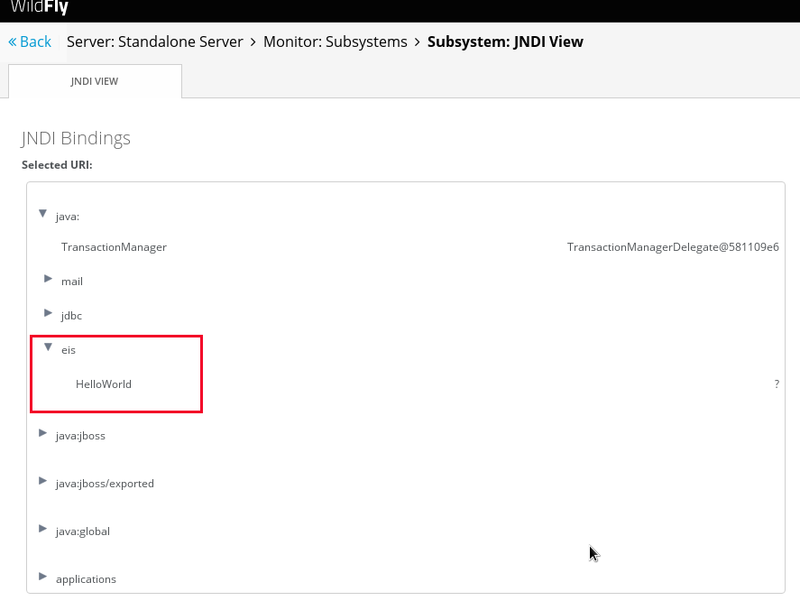 To make the adapter visible to the client application a wildfly specific deployment descriptor named 'jboss-deployment-structure.xml' is necessary. The attribute 'export="true"' is only(!) necessary for Ear bundles. And it is mandatory for Ear bundles. The 'jboss-deployment-structure' did the same, as the Java EE containers did with all the Database, Mail or JMS adapters. It simply adds the code into the application classpath. There I will provide hopefully additional information about implementation and deployment. This issue has to do with the fact, that in case more than one JCA resource adapters are used in one transaction, the adapters should/must support XAResouces. I can't figure out how to implement a JCA resource adapter as a XAResource. But the Transaction Support was the only reason why I started this project. My initial goal was to have a JCA Hadoop Adapter which can participate in a complex transaction (initiated by a JPA entity update) , so that this JCA adapter can remove changes from hadoop if a Exception / Rollback occurs. Now I see that JCA Resource adapters seem to be much more complex as I expected. If anyone has an simple(!) example how a JPA XAResource Adapter should look like, please add this information to this thread.